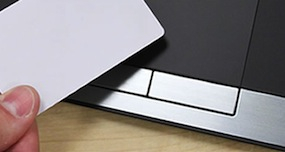 Cirque announced its latest GlideSecure trackpad solution which features on-board EMV contactless card reading functionality and integration with SecureKey Technologies’ authentication services. As a fully integrated technology solution, Cirque’s secure input solutions with SecureKey’s technology will provide an solution for payment and authentication peripherals, as well as in consumer electronics such as notebook PCs and tablet accessories. SecureKey’s authentication solution turns ordinary consumer devices into secure terminals that enable simple tap-to-pay and tap-to-authenticate consumer experiences using real-world payment and identity credentials. Cirque technology is able to meet the requirements for PIN number entry on a touch sensor (PCI PTS 3.0). With the addition of on-board EMV contactless, and SecureKey’s authentication capabilities this will complete the total secure input solution. Cirque and SecureKey will be demonstrating the GlideSecure trackpad concept at the CARTES Exposition from November 6 -8 in Paris, France.